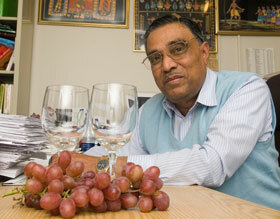 Dipak Das, the resveratrol researcher who had 19 papers retracted following findings of misconduct by the University of Connecticut, has died at the age of 67. Das died on September 19, according to an obituary posted to the Hartford Courant‘s website. The obituary does not give a cause of death. Part of Das’s June 2010 response disputing UConn’s investigation — which eventually found him guilty of 145 counts of fabrication and falsification — was to say that he had suffered a stroke because of the stress. Das lost his tenured professorship at UConn last year. The Connecticut Mirror notes that he had filed a lawsuit against the university earlier this year. When a prominent faculty member dies, even alumnus or emeritus, it is usually reported on a University’s website, with a blurb about their contributions to science/society. Such an article is notable in its absence from the UConn website. I wonder if they were hoping nobody would notice this event? Das’s death does raise the issue of who is now responsible for clearing up the remaining mess, retracting the papers, paying back grant monies, etc. Will attention shift to other senior members of his group who were mentioned in the UConn report? ORI has yet to release their official findings, and it’s not clear what the protocol is when a respondent dies. I would have thought ORI would have issued a statement of their intentions by now, 2 weeks later. Das (peace with his soul) has just capitalized on the opportunities which current system of academic publishing provides. Yes, the problem is now Who will clean the mess? This case is a great opportunity to (at last) start holding Editors and Publishers accountable for their contribution in misuse of great deal of hard-earned tax payers’ money!!! Isn’t it technically the case that federal grants (i.e., the money) are awarded not to the individual PI but to the supporting institution? I would therefore think that although a potentially ‘offending’ individual associated with the award is no longer alive the institution is, and always was, ultimately responsible for, as you say, cleaning up the mess and returning grant monies. Yet I can’t think of a single case in which, following a full investigation that revealed undeniable, clear-cut, no-doubt-about-it malfeasance, money was returned to the granting organization. Has that ever occurred? The Milena Penkowa case comes to mind (guess where I work 🙂 ). Actually, there the money was already returned before a clear-cut verdict had been obtained. The university paid back around 2.1 million DKK (about 380,000 dollar), Penkowa herself returned 250,000 DKK. At last to see a case of doing-the-right-thing! Danish people also value the Krone/Euro (their hard-earned tax payers’ money) more than the Queen, therefore they demand accountability. My condolences to his family and friends; it’s never easy to lose someone. Right. Let him lie down in peace no matter what he did in this world. He must have enough from this world, good and “not good” (I don’t want to say the word “bad”). ORI cannot make any statement now. Federal Government is closed.. I am sure I will get 100 thumbs down, but allow me to express what many want to express but are afraid to. With all due respect to his family and friends. Let us not fall prey to the pseudo-forgiveness of death. We are not monsters, but we are not fools either, independent of his health condition. His family will mourn, but the scientific community will stay and must stay angry and enraged at his fraud. Simple. He must always be remembered not for his family traits, but for his professional fraudulent characteristics. Forgiveness would have made sense had he been alive and in fact paid back all of the profits he made off his hundreds of fraudulent papers. Then we could have said, you may “pass away in peace”, because he then would have paid the price for his fraud. But the truth is, he led a good life in the USA, living large and very well, most likely with a good propery and car, nice health benefits and a great laboratory. Yet, his benefits were based on wide-scale fraud. This while the rest of the US citizenry plunges into deeper and deeper recession, poverty, poor (and more expensive) health benefits. I am sorry for taking this hard-line approach, but the legacy of Mr. Das can only be summarized in a single word: FRAUD. There was no fraud. Can you point to available evidence of any fraud? Why did UCONN remove their online report and URL on this topic? Das was never permitted to defend himself. He was denied due process. You are relying on evidence that cannot be examined. The evidence disc was destroyed by UCONN. I deeply agree with Mr.Bill Sardi’s comment. What’s behind all of this? will never be cleared..
Thumbs up, The Grim Reaper (hey, what are you going to be for Halloween?). Death does not and should not wipe the slate clean. Our actions and decisions define who we are and Das’s actions and decisions define him as a liar and a cheat. Not saying I’m glad Das died, just saying I don’t care that he died. The scientific world lost nothing and actually stands to gain by not having him around anymore. As for YouKnowBestOfAll’s sentiment that Das just capitalized on the current publishing paradigm, that’s like saying it’s acceptable to shoplift by taking advantage of a blindspot in a store’s video surveillance network. 34 articles recovered from PubMed with “das dk ischemia resveratrol”. Six of those articles are also retrieved with “das dk ischemia resveratrol retracted”. Is the optimal dose of resveratrol for stroke prevention not yet known then? And if not, will it be difficult to establish, given the quality of some of the other resveratrol/stroke literature? Two examples. Br J Haematol. 2007 Nov;139(3):475-85. Epub 2007 Sep 14. Inhibitory mechanisms of resveratrol in platelet activation: pivotal roles of p38 MAPK and NO/cyclic GMP. Shen MY, Hsiao G, Liu CL, Fong TH, Lin KH, Chou DS, Sheu JR.
Graduate Institute of Medical Sciences and Topnotch Stroke Research Centre, Taipei Medical University, Taipei, Taiwan. Fig. 2D alpha-tubulin control: Lanes 1-2 are the same as lanes 3-4. Lane 1 of p-p47 is a lighter version of alpha-tubulin lanes 1,3. Cell Mol Life Sci. 2012 Jul;69(13):2245-60. SIRT1 modulates MAPK pathways in ischemic-reperfused cardiomyocytes. Becatti M, Taddei N, Cecchi C, Nassi N, Nassi PA, Fiorillo C.
Department of Biochemical Sciences, University of Florence, Florence, Italy. Lanes 1 and 2 are the same. The vertical splice is visible. Lane 4 is probably the same with some differences, perhaps due to JPEG compression. Lanes 5 and 8 have the same upper band shape. They have the same dark blob on right with pale artifact just lower left. However the lower bands are different between lanes 5 and 8. Fig. 6C ERK slice. Observe how there is a vertical shift between lanes 2,3 and again between lanes 5,6. This is because lanes 3 and 6 are the same. Lanes 5 and 8 are also the same as each other. More economy of blot here. Am J Physiol Heart Circ Physiol. 2008 Mar;294(3):H1388-97. Activation of SIRT1, a class III histone deacetylase, contributes to fructose feeding-mediated induction of the alpha-myosin heavy chain expression. Pillai JB, Chen M, Rajamohan SB, Samant S, Pillai VB, Gupta M, Gupta MP. Division of Cardiothoracic Surgery, Department of Surgery, Committee on Molecular Medicine and Pathology, The University of Chicago, Chicago, IL 60637, USA. Fig. 1A Lane 4 is the same band as in Fig. 4C lane 3. Fig. 1B Upper panel lanes 1-3 are the same as Fig2B lanes 1-3 thogh the latter are darker. Also the lonesome band to the right in Fig. 1B is the same as lane 1 in the other two gel slices. Fig. 1B Lower panel, lanes 1-2 are the same as lanes 1-2 in Fig. 5E lower panel. Fig. 2A lane 3 is a different contrast version of lane 4. Fig. 2C Left lane the band is the same as in Fig. 3A left lane. Figure 2C 2nd lane is the same as Fig. 3A 3rd lane. Apart from bands having the same profile, the irregular white spot is in the same place (though a little smeared by JPEG compression). The splice edges for Fig. 3A lane 3 are visible both sides. Fig. 5E Splices visible before lane 3 in both gels. The more you look at this, the more surreal it is. According to PubMed, the literature for “resveratrol ischemia” begins one day in July 1999, with a paper from the Das laboratory. (Can anybody shed more light on this?) So he apparently founded a new and incredibly exciting field where a natural antioxidant had remarkable effects on laboratory mouse models of stroke damage. From this point on, with many grants funded worldwide, there are some interesting properties of the literature. PubMed query with “das dk ischemia resveratrol” retrieves 34 publications. PubMed query with “das dk ischemia resveratrol retracted” retrieves 6 papers, the earliest from 2002. PubMed query with “ischemia resveratrol” yields 233 publications till now. When the results of the painstaking internal U. Conn enquiry were released, it was made clear that a large number of papers were expected to be retracted. Considerably more than have so far been processed. For example, one image is reproduced in two back-to-back 2002 publications, one retracted (Fig. 7B; PMID: 12003802), one not yet (Fig. 5; PMID: 12003803). The retracted publication had an awful concoction in Fig. 7A: open access and very educational for the innocents should any exist amongst the blog visitors. Retraction was the only option. As should be clear from my two comments posted above, it is easy to find issues with figures among the 233 publications that populate the field that Das pioneered. Seek and ye shall find. I challenge any researcher to repeat Dr. Das’ experiments and prove they are invalid. Others in Europe and Canada have repeated Dr. Das’ experiments with similar results. Das showed that small molecules such as resveratrol derived from wine and allicin from garlic activate biological defenses (endogenous antioxidants glutathione, catalase, SOD) that precondition the heart so as to reduce an experimentally-induced heart attack to a non-mortal event. Das reported the effect was dose dependent with mega-doses actually increasing the fibrotic (scarred) area of heart muscle while modest doses reduced damage. Over 20 years after Serge Renaud reported on the French Paradox, that the red wine-drinking French had a much lower mortality rate for coronary artery disease, not because of cholesterol, but because of the ability of wine to prevent clotting and to provoke arterial dilatation via nitric oxide, there is little clinical use of resveratrol. Cardiology is dragging its feet intentionally here. While statin drugs continue to be widely recommended and prescribed, there is scant evidence they reduce the risk for mortal heart attacks. Before you respond to this comment, go back to your laboratory and repeat Dr. Das’ experiments and return here to report what you found. Am J Physiol Heart Circ Physiol. 2002 Jun;282(6):H1988-95. Pharmacological preconditioning with resveratrol: role of nitric oxide. Hattori R1, Otani H, Maulik N, Das DK. Retraction in Am J Physiol Heart Circ Physiol. 2012 Jun 1;302(11):H2446. In Figure 5, a control and an aminoguanidine+resveratrol-doped tissue both do very well for apoptosis. But when both images are from the same sample, it is way beyond my skills to do this experiment. Limited in vision as I am, I cannot design a protocol to recover different experimental results from a single snapshot. My own incompetence could well be the problem but, until clarified, I may continue to point out image fabrication in resveratrol/ischaemia papers even though I have no idea how to repeat the claimed experiments. Pray tell, did researchers in Italy and Canada, essentially conducting the same animal experiments as Dr. Das, also fabricate their research that came to the same conclusion as Dr. Das? What is odd is that the western blot images represent gene protein expression, that is, what gene mechanism was involved. But there were actual photo images of the rodent hearts and the area of damage induced experimentally both with and without resveratrol. Those images clearly show there was far less damage in resveratrol-treated rodent hearts. 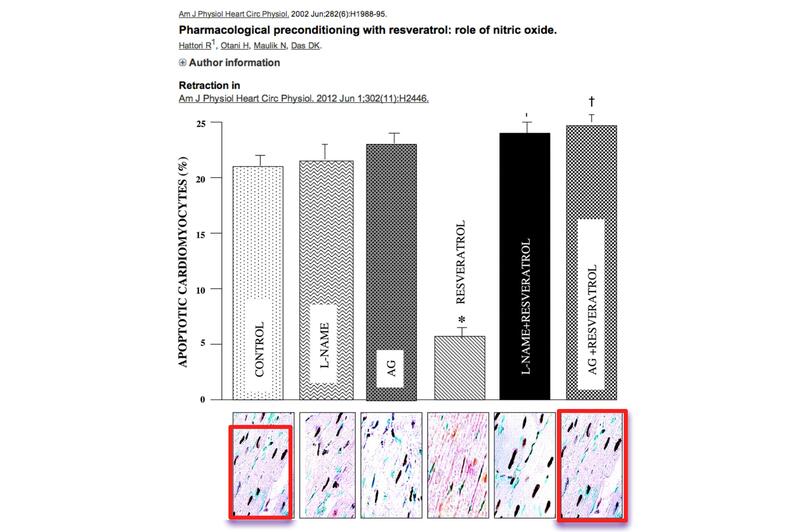 If you want to argue that the western blot images were doctored, OK, but that would not alter the primary conclusion of the study, that resveratrol cardioprotects the ischemic heart. Doctored western clots would alter any conclusion as to the gene mechanism involved. Furthermore, in one study published at PLoS ONE, Dr Das submitted the same tissue samples he performed western blots on to NIH researchers who performed more sophisticated microRNA analysis, which corroborated with the western blot analysis. Was Das sloppy? Who knows? But why didn’t peer reviewers catch all this? All UCONN need do is re-post all the evidence online that they initially posted in January of 2012 so we can all evaluate it. Why was it removed from view? I am the computer forensics expert that was hired by Dr. Das’s counsel and tasked with looking over the 60,000 page report, the video “proof” and the 52-page final narrative. More than 95% of the 60K-page (actually 59,929 pages) was a listing of the files on Dr. Das’s primary computer. The other <5% was data, commentary, indices to the contents of the report, and the professor's own response. The video evidence purporting to show the most egregious examples of fakery would not have held up in court. It certainly did not rise to professional forensic standards, and was surprising to me that it was produced by scientists as it was very weak in its many unsupported assertions and loose language. The evidence was badly mishandled and after being shipped the wrong data, we were never even given a forensic image of Das's computer, but rather a copy of his files with dates far more recent than the time of the seizure of his equipment. My impression was that the Dr. was railroaded. I, March of 2012, I submitted an Affidavit that in essence says the same.